Andrew E. Thorberg, born in Ronberg, Norway on 20 May 1857, to a family which included two brothers and three sisters. The family immigrated to America, but Andrew came alone to Davenport, Iowa in 1876. He worked and attended school for a year to become acquainted with the English language. In 1878 he struck out with the West Coast in mind, but he came to Dakota Territory with the survey crew working for the Northern Pacific Railroad platting the new town of Mandan. The Missouri Slope region satisfied his desires, and he remained here once the survey crew finished its work. Initially he made his living as a trapper during which he became well acquainted with the countryside and its resources. Thorberg's outdoor life gave him ample opportunities to observe the soil and natural resources of the region and formed the foundation for his life values. About 1880, he accepted a position as clerk in the store of Hanover and Barth Clothiers. He continued to work there until 1887 when he accepted a position in the Granberry and Cummins, Co. store. Shortly afterward, Mr. Granberry died. Cummins gained new partners and the store was renamed Cummins and Tubbs. Thorberg bought a working interest in the store at that time. In 1891, Thorberg bought out Tubbs and the store was subsequently renamed Cummins and Thorberg. With the later addition of a third partner, the store operated for decades as Cummins, Thorberg and Theis. In 1890, under President Harrison, Mr. Thorberg was appointed postmaster of Mandan which office he held until 1894, when he resigned because of other pressing duties. In 1914, Mr. Thorberg retired from active business. But he continued to invest heavily in the community, opening the Thorberg Tile Company at Old Fort Lincoln flats in 1917. The company specialized in building tile, but also produced rough clay products and high-grade building brick. After arriving in Mandan, he conducted experimental work in his garden with fruits and trees. He disposed of his retail store stock in 1916 and invested in farm lands, bought from Peter Hendrickson (a cousin), Leanard Johnson and his son Alfred Johnson. This passion for botany fueled his determination to lobby for the establishment of a Federal dry land Agricultural Experiment Station in the area. Thorberg was one of the founders of the Morton County Fair Association. In 1895 and in 1893 was in charge of an Indian exhibit at the Chicago World's Fair. He represented the city at Congressional hearings in Washington, D.C. to attempt to get an Indian School located in Mandan. Mr. Thorberg always got along well with the Indians, coming in contact with them often in his business, he learned to talk their language. He was well acquained with Sitting Bull and was one of the party who accompanied him to the World's Fair. He was active in organizing the first commercial club of Mandan which was known as the Mandan Business Men's Association. 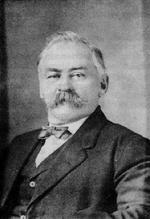 Thorberg also helped established the Mandan Fair Grounds. Although active in politics he did not care to hold public offices. With the exception of the four years he was postmaster, he never held a political office. He took a lively interest in political campaigns always anxious that the best man represent Mandan in Congress. He married Ida Karoline Johnson born 1 March 1864 in Drogsta Sodermanland Sweden to Jonas Eric and Clara Karoline (Carlson) Anderson. Andrew and Ida Thorberg were the parents of eight children all born in Mandan: Eric A. born in 1887; Clara Higgins born in 1889; George E. born in 1890; Harry S. born in 1892; Lilly Kleinschmitt born in 1894; Ida Diebert born in 1897; Clifford born in 1899; Robert V. born in 1905. Andrew Thorberg died on 24 February 1921. He is buried beside his wife in Mandan's Union Cemetery. This biography is based largely on the entry for Mr. Thorberg in the Morton County Roots published in 1976 by the Morton County Historical Society.